Some though aren’t ready to say goodbye to the woods. Some still are heading out. The popularity of hunting deer antler sheds has gained popularity in recent years. Most of the people who are lacing up their boots and heading to the woods over the winter months say looking for deer antlers is a great way to fight boredom while enjoying the woods. 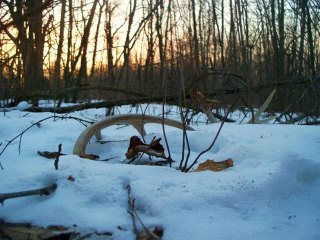 In case you’re unaware of what this somewhat new breed of hunters are up to in late winter and early spring, shed hunting is the act of going through whitetail deer habitat looking for the antlers of male deer.